A central angle of a circle is an angle formed by any two radii of the circle. These radii each intersect on point on the circle, and the portion of that circle between the two points is called an arc. So every arc of a circle is associated with a central angle, and vice versa. We can name which arc is created by a central angle, and we can name which angle corresponds to a central arc. Let’s try it out. Solution: Arc \(GH\) is the smallest arc between point \(G\) and point \(H\). Each point of the arc has a radii passing through it, and meeting in the center of the circle. The angle between those radii is \(\angle 3\). 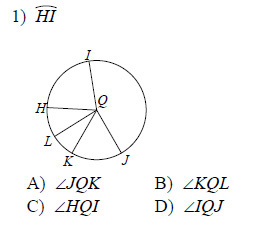 So \(\angle 3\) is the central angle associated with arc \(GH\). 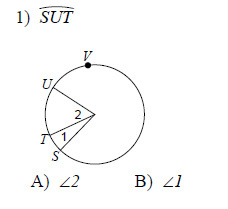 Example: Name the Major Arc for \(\angle 1\). Solution: The major arc associated with angle 1 is the largest arc between points V and U (since the radii from angle 1 intercept at those two points). To name a major arc, we name the two endpoints of the arc, as well as an intermediate point that the arc passes through, say W. Then the name of the arc formed by angle 1 is UWV. 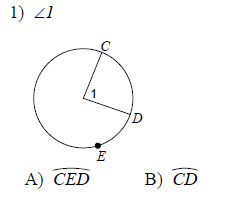 Name the arc made by the given angle. If an angle is given, name the arc it makes. If an arc is given, name its central angle.